It isn't uncommon to hear of people finding great scores on Craigslist. So, in the hope of finding the perfect, kid friendly, round coffee table, I decided to give our local Craigslist a shot. Unfortunately, I didn't come away with any hidden gems. 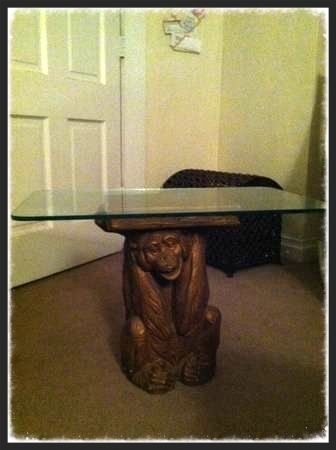 What I did find were several -umm shall we say- unique, animal/mammal themed tables. Take a look. Someone please massage the kink out of this monkey's neck.